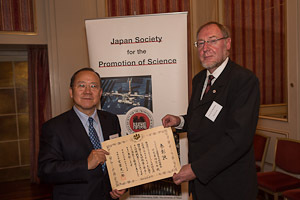 The German JSPS Alumni Association (JSPS Club) received the commendation of the Japanese Foreign Ministry for the exemplary pursuit of relations with Japan in the field of science. Japanese Embassador in Germany Takeshi Nakane presented the certificate to chairman Heinrich Menkhaus on September 25, 2012 in Bonn. With this award, the Japanese Foreign Ministry annually honors persons and organizations worldwide for their special engagement in the field of cultural and scientific relations between Japan and other countries. In 2012, 62 persons and 18 organizations were honored. As regards Germany, in addition to the JSPS Club also 2 persons have been awarded. In his laudation, the Japanese Embassador praised the endeavours of the JSPS Club for deepening the scientific relations between Germany and Japan. In this sense, the ”JSPS Alumni Club Award“ truly represents an innovation. The association wants to acknowledge young and established scientists, who are actively engaged in the building of cooperations and networks in the German-Japanese context. The prize will be awarded for the first time on April 26, 2013.